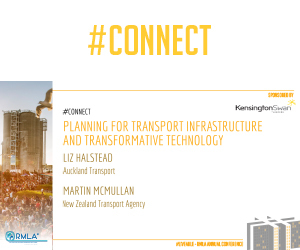 Martin McMullan, NZTA and Liz Halsted, AT, will discuss the future of the mobility market and how changes in technology are affecting transport infrastructure in Auckland and New Zealand, from the introduction to network wide mobility apps, to future proofing corridors to flying shuttles. Martin McMullan Journey Solutions Director, NZTA. Since July 2016, Martin has led the New Zealand Transport Agency’s approach to innovation and new technology. He is passionate about using data to provide smart solutions that connect people, services and infrastructure. Martin joined the Transport Agency in 2014 as Zero Harm manager. He has more than 15 years’ experience in the engineering and construction industry, established two technology start-up businesses, and he sits on the Construction Safety Council Board of Directors and holds an executive role with the Australian Driverless Vehicle Initiative. He is also a registered member of the Institute of Directors in New Zealand.